George North won the battle of the Saints as his Wales side secured a stunning 28-25 World Cup victory at Twickenham. In one of the biggest pool games in the history of the competition, Ospreys fly-half Dan Biggar landed 23 points to give Warren Gatland’s men the win. Tom Wood and Courtney Lawes, who was forced off at half-time, started for England, who looked to be in control for the majority of the game. Jonny May’s first-half try and the assured boot of Owen Farrell, who kicked 20 points, looked to have set Stuart Lancaster’s men on their way to the win. But Wales never gave up, despite suffering three second-half injuries, and Gareth Davies’s try followed by Biggar’s conversion and penalty won the game. North and Co had started strongly, winning a penalty on the edge of England’s 22 after Lawes was penalised for not rolling away. Biggar landed the kick to the delight of those wearing the red of Wales, but England responded with a huge shove in the scrum, squeezing a penalty from the referee. 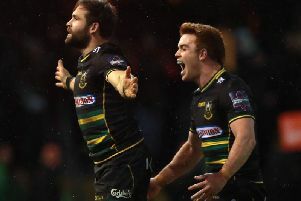 Afer Joe Marler and Dan Cole had engaged in a celebratory push, Farrell landed the penalty with aplomb, striking it through the posts from close to halfway. Biggar put Wales back in front after Cole was penalised at the breakdown, but Farrell again replied, succeeding where his opposite number had failed, by landing a drop goal. England were on fire in the scrum and after Dan Lydiate chopped Wood down, the forwards did the business to earn another penalty from referee Jerome Garces. Farrell was again assured with the boot to put his side in front for the first time. And he was soon adding a conversion to his tally as Lawes took one for the team to win a penalty for England and they used the field position gained to send May over. Biggar cut the gap to seven with a penalty before the break, which brought an England change, with Lawes forced off. But the men in white were soon restoring their 10-point lead early in the second half as Farrell again hit the target. In the continual kicking battle, Biggar issued an instant retort before Farrell again stretched England’s lead. Lancaster’s men were strongly resembling Saracens, playing a determined kicking game. But Biggar again narrowed the gap in a clash that was turning into a penalty shoot-out and he was at it again moments later as England continued to pay for their indiscipline. With just four points in it, it promised to be a frantic finale and Wales’ hopes were being hit by injury, with Scott Williams, Hallam Amos and Liam Williams forced off. That gave England the impetus they needed and Farrell landed a penalty, but Wales weren’t done and they hit the hosts with a sucker punch. Davies latched on to a kick ahead and dived under the posts, with Biggar’s conversion levelling the scores at 25-25. And things were to get even better for Wales soon after as Biggar landed a monster penalty from halfway. Suddenly, England were three points down heading into the final five minutes. A tense Twickenham turned up the noise in a bid to carry their side back into the game, but after England went for the corner from a kickable penalty, Wales won the ball back. And that was to be that as the men in red celebrated a memorable victory. England: Brown; Watson, Barritt, Burgess (Ford 70), May; Farrell, B Youngs (Wigglesworth 49); Marler (M Vunipola 61), T Youngs (Webber 66), Cole; Lawes (Launchbury 40), Parling; Wood, Robshaw (c), B Vunipola (Haskell 63). Wales: Liam Williams (Priestland 66); North, S Williams (Cuthbert 63), Roberts, Amos (Lloyd Williams 66); Biggar, G Davies; Jenkins, Baldwin, Francis (Lee 49); B Davies (Charteris 70), Wyn-Jones; Lydiate (Tipuric 70), Warburton (c), Faletau.